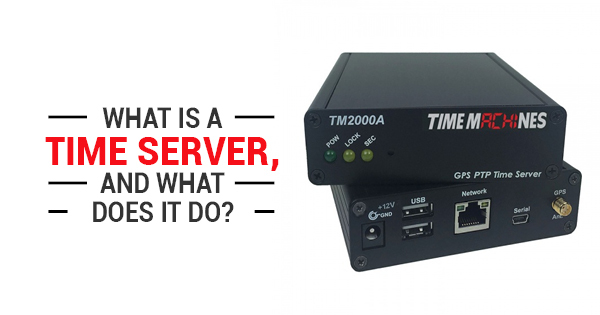 What Is A Time Server, And What Does It Do? | TimeMachines Inc. When managing several devices within a single network for your business, there’s plenty that could potentially go wrong. Usually, when people think of digital problems, they’re unlikely to think of one of the supposedly more simple features of computers: clocks and timekeeping. However, there are plenty of ways digital clocks and errors with timekeeping can throw off your business. Digital clocks can tell time incorrectly or thrown out of synchronization when set individually. The solution? Time servers. But what do time servers do, and how can they be helpful? Read on to find out. Time servers are a type of server computer. These server computers will read the actual time from a reference clock, typically a GPS clock due to their high accuracy, and distribute that information through a computer network. This information keeps all timekeepers and clocks within the network properly synced. NTP network time servers, a specific type of time server, use Network Time Protocol, one of the oldest Internet protocols still in use today. What Are Time Servers Used For? When an NTP time server is not used, it can be incredibly detrimental to your business. Clocks not coordinated by a time server usually do not display the actual time, instead of being off in either direction by a minute or two. This can cause problems with tracking billing, emails, digital security, and many other important digital elements for your business. Using time servers for your business can prevent errors or complication in digital processing and organization by ensuring that all computers and devices on the network are synchronized to the same clock and will all display the same, accurate time. With all timekeepers in your network being based on one highly accurate clock, as opposed to all being set individually, your business will be able to run more efficiently and with as little error on account of digital timekeeping as possible. Thinking you may need a time server for your business and digital network? Contact Time Machines for all your time server and digital clock needs, and to see if a time server could benefit you and your business.